Permanent makeup looks great on everyone! Afro American Permanent Makeup is a highly sought after service that results in the enhancement of select facial features. Permanent makeup is widely available to anyone, regardless of skin type or skin tone. However, many professional technicians are not skilled in the process of intradermal pigmentation for African-American skin. As a result, Afro-Americans are often turned away from professionals at clinics and salons. This is due to the complex nature of color matching for dark skin tones. Even with the incredibly diverse selection of colors available to most professional technicians, it is still, according to many of them, difficult to determine a suitable match. Rather than risk a result that is not pleasing to the client or legal backlash of some sort, some professionals instead refuse treatment. This has long been an unfortunate aspect of the permanent makeup industry. In recent years, however, there has been a positive trend in Afro American Permanent Makeup application. Many clinics are now offering color matches that are recommended especially for African-American skin. Theoretically, anyone of any skin tone may select any color he or she wishes. However, the technician will not usually agree to what is a visibly unsuitable match. Certain colors are best-suited for African-American skin. Permanent makeup cosmetic company SofTap® Permanent Cosmetics offers an outstanding option that makes it easy for people of any skin tone to find colors that work for them. The brand's cool and warm color palettes offer diversity in color selection that is typically unseen in other brands. 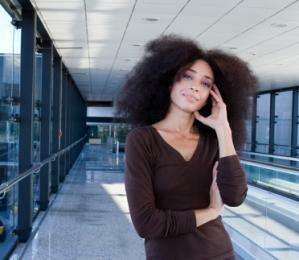 African-American skin, along with Hispanic and Asian skin, is more prone to hyperpigmentation. Hyperpigmentation occurs when the skin retains more color than is typical, thus resulting in a darker shade. This is due to the great amount of melanin present in these skin types. Though it typically takes several weeks for the final color to be determined (this occurs as the area heals), darker skin types may actually hang on to the color more. This is why it is crucial to select the right colors - those that are appropriate not just for dark skin, but that will settle appropriately over time and leave behind the result that the client desires. The color is just a few shades lighter than the requested hue. The color mixes with about 20-30% of the client's natural melanin, which results in a black color. Eyebrows: If an African-American client requests darker eyebrows, the technician will select a shade that will eventually lead to the desired hue. For example, if dark brown is the desired outcome, then the technician may choose something that looks slightly red-toned to the naked eye. It is important not to be alarmed; keep in mind that the color will eventually settle to your desired shade. If, for some reason, it does not do this, a color touch-up will likely be required to adjust the shade slightly. The lips will show clearly any disparaging colors. This is less likely to occur on darker areas like the brow or near the lash line. The lip area is certainly complex. Many color changes occur on the lips. They are red due to the ample supply of blood, and they also have strong blue undertones. This results in a highly complicated color selection process. African-Americans must exercise extreme caution when selecting lip colors. Keep in mind that only various shades of brown may be achieved in Afro American Permanent Makeup. Red, however, cannot. The technician will typically choose shades that are three to five times lighter than the desired color. As a general rule of thumb, the darker the skin, the darker the end result will be. Lighter-complexioned clients may have a bit more room to experiment, but it is important, as mentioned, to undergo a patch test in all cases.